There is a reason that dogs love the smell and taste of fish. Fish is a healthy source of protein and is often included in commercial dog food as an alternative protein source. Fish is rich in omega-3 fatty acids, which may have health benefits such as decreasing inflammation and help with joint mobility. Fish is also a good alternative for dogs with food allergies to more common ingredients, like chicken. Fish treats have become very popular as an alternative to meat treat and dogs are definitely giving them the paws up. Purely Fish is a Cornish company specialising in natural fish dog treats using fish caught off the Cornish coast. We humans, know that the best fish comes from Cornwall know it is time to share that secret with our four-legged friends too. 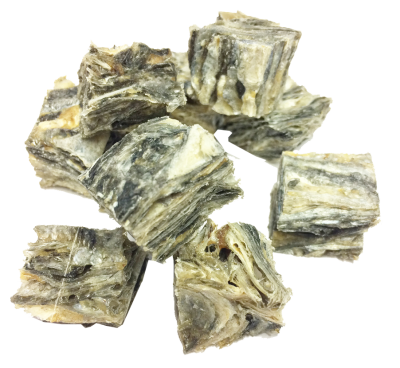 Large parts of the fish are wasted in the preparation of fish for humans whilst much of these by-products make for tasty treats for our dogs using fish that is fit for human consumption. The ethos is to use as much of the fish as possible. Xtra Dog is thrilled to offer these 100% fish based treats, produced in Cornwall. Our own dogs have tested these treats and they are delighted to be able to share the joy with your dogs too.